G P JACOMB-HOOD SIGNED Portrait. English artist who was chiefly a portrait painter. 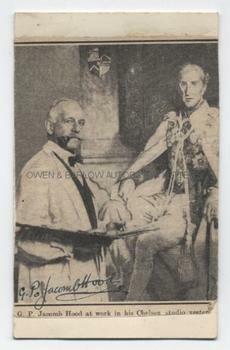 Newsprint portrait photograph, signed in lower left corner. The photograph shows Jacomb-Hood at work in his Chelsea studio, standing before a large canvas. Mounted on a post-card. George Percy Jacomb-Hood was a founder member of the Chelsea Arts Club, known for his urbane socialability. He was a friend and horse-riding companion of the artist John Singer Sargent and was his neighbour in Tite Street. Jacomb-Hood accompanied members of the Royal Family on tours to India as official artist.